I am creating a view to breakdown the number of node published per week using views. I were able to create a view that will show me the breakdown day or month but there is no option for week. How will I do that? Also how do I make it show the first day of that week or the first item publish for that week. 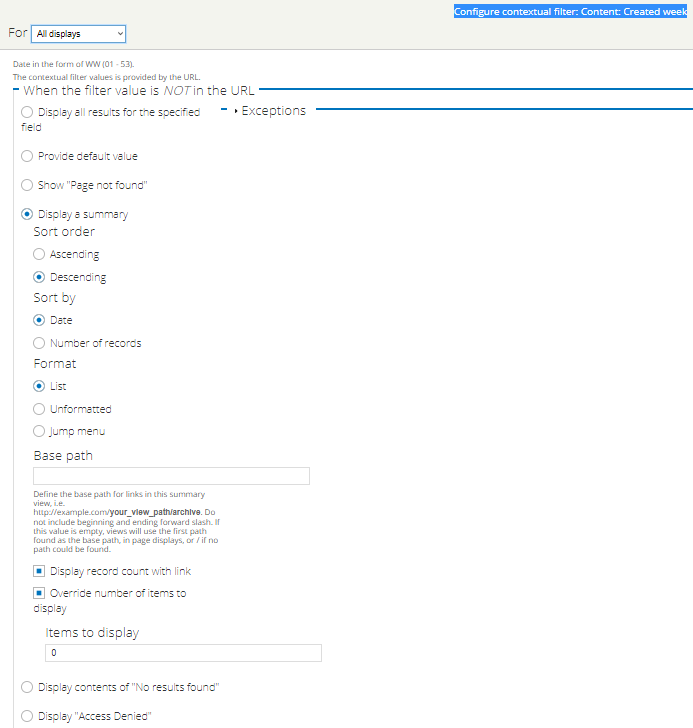 How can I add the query to the view? and the list is still the same grouping by day showing week. The numbers in parenthesis are the number of item published that/a day of the week. Example on week 21 we published item 6 days in that week and in the parenthesis is the number of item published for each day. You can show weekly results using a Contextual filter. Override number of items to display to 0 to have an infinite number of weeks show. Use this if you want the Pager to control the number of nodes shown for each week (if there are many). Otherwise, the Pager will apply to the number of weeks as well as nodes! The Sorting criteria you add to the Views will affect the list of nodes you see after you click through a summary week link. 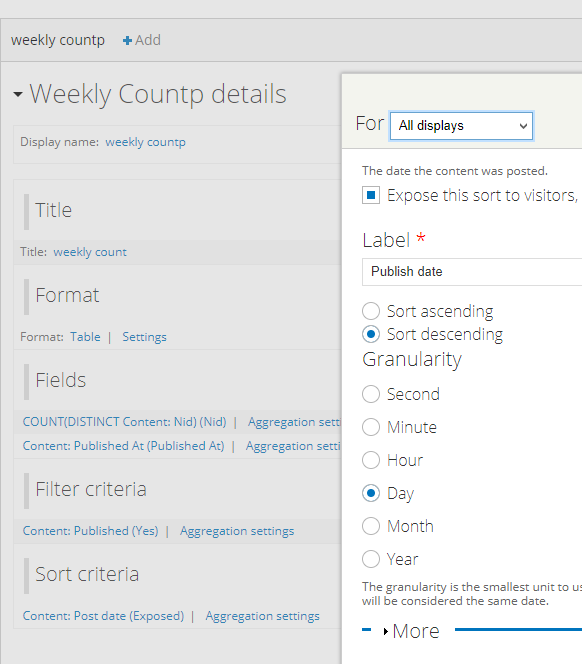 If you add the Content: post date criteria, the nodes will show as the oldest first if you set it to ascending. For more control, you can use Aggregation to count the results, but it involves a lot more steps to recreate the Summary like above. 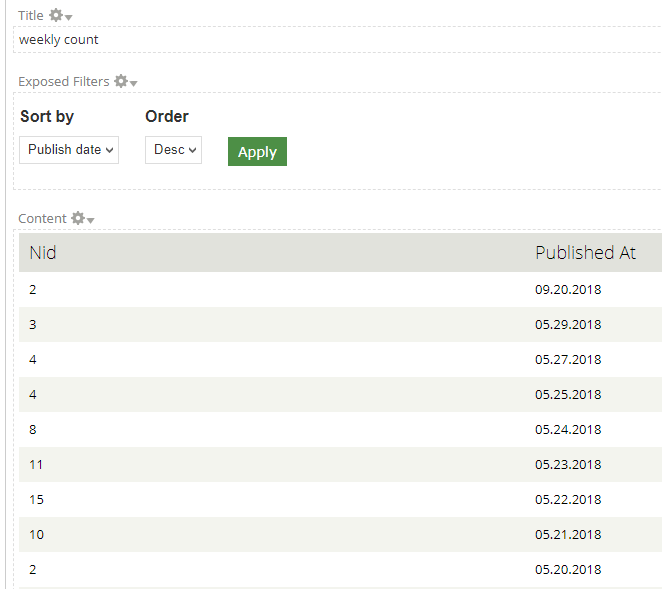 After you turn on Aggregation simply change one of the Fields that is unique (for example Node ID) to Count DISTINCT and it will show the number of results. You'd have to combine it somehow with the Contextual weekly filter if you wanted to display something different from the Summary, possibly create one Views display for the first node of the week, then in an Attachment do the counting and attach it to the week. Adding a set query to Views is a bit of an overkill since the purpose of Views is to build queries (through an interface). Not the answer you're looking for? Browse other questions tagged 7 views nodes or ask your own question. My module adds a CCK field to an existing content type. How do I then modify an existing view to sort using the new field? How to exclude nodes from views result?